Anyone switch to Spikeless golf shoes? lenman73 replied to MGN's topic in Balls, Carts/Bags, Apparel, Gear, Etc. I have been using spikeless for a few years now. I actually find I have more grip with them. In wet conditions especially, I find leaves and grass shavings will collect in my soft spikes and if I'm not paying attention it builds up enough that my rear foot will slip. But this problem does not happen for me with spikeless shoes. lenman73 replied to Hacker James's topic in Balls, Carts/Bags, Apparel, Gear, Etc. Yes. Instead of directly behind the ball, just offset it on an angle. Still the same level. I don't know which way. I spose you could try to the left and right and see what works better. I think the other thing is where the sun is at. People had some problems if the sun was blaring right at it. I read somewhere else that some who were getting weird readings set it up behind them on a slight angle instead of behind on a straight line. That seemed to be a fix for them. I recently bought one and got to use it for the first time. My experience was luckily the opposite. I used it on pw, 9i, 3w and driver. It was my first range session this year but I was seeing numbers that were pretty spot on from what I was hitting last year. I never got an outlier high or low that wasn't seen with my eyes. If I duffed one it showed it. Some were better due to the effort I put in this winter to improve but over all I was happy with the purchase of this unit. What If There Was No Club Fitting as We Now Know It? On a whole I get what you are saying. Even playing with my usual buddies on my league or weekend group, most if not all do as the link you provided describe, and use the same swing shot after shot. Whether a curse or a blessing, I dont fall into that category. If i go have a set bent 2° flat (Just using as an example) and go to a more upright swing I will more than likely start losing shots to the right. I am an admitted club also, I switch clubs like swings on a whim. I do get all of my irons used on the cheap now and do agree that if the specs are way off then it will be a detriment. Years ago, i did go through and have all the lies checked on a new set and they all were good stock at that point in time. I understand not all are created equal. But at this point in time as far as irons go I worry about flex and length. Right now I am not committed to swinging one way or another. It is more about what my body is capable of doing on any given day given injuries and failing joints. I am strictly speaking for myself and make no attempt to discredit those that do undergo a full fitting. But for myself presently, at 5'10" irons off the rack fit for now. I am not saying I will never go through the process but a commitment to a swing will come first. Hope this made sense. I have mixed emotions about the whole fitting thing. I know some swear by it and I am in know position to dispute that. For me personally, at this point I can only see the benefit in the woods. For irons I am and will be for a while anyway an off the rack kind of guy. I know my swing just isn't consistent enough to have lies bent one way or another. In one round I can start off with a flatter one plane swing but if my right knee flares up and I can't push off the ground as hard I will adapt and go to a more upright 2 plane swing. It's all what I can do on any given day. I even can employ 3 different grips in a round. Start with interlock and go to overlap and then maybe the 10 finger. It's all about whatever I need to do to get the ball going where I want. That said I know I'm more of an outlier and an exception and not the rule. I just picked up a set of 755's off of eBay this winter for sixty bucks. I have only used them once on an indoor simulator playing Bay hill but I was left with very good impressions of them. I can't wait for spring. 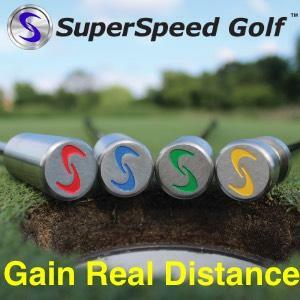 Anyone try the Callaway Superhot 70 balls? lenman73 replied to PARthur's topic in Balls, Carts/Bags, Apparel, Gear, Etc. I played these the first time Wednesday night. After I slight adjustment period I found I liked them and they had good distance for me anyway. The hardest thing to get used to was how straight it went on approach shots. I normally draw my irons and missed 4 greens to the right. They were all just right but when I talked myself into aiming more straight on, happiness followed. Interlock grip vs overlap grip? I had to go away from the interlock again this year. After not using it for many years, I tried returning to it this spring. But i just not have a sense for where the club head is using it. So i basically use a 9.5 finger grip where the pinky of my right hand is just riding about half way up the side of my left index finger. It is comfortable and for me anyway, I can tell where the club is. They came out the gates and birdied the first 8 ! I was impressed. lenman73 replied to lenman73's topic in Balls, Carts/Bags, Apparel, Gear, Etc. In 2001 I sprained my right knee and already had cartalidge damage in it. Being a right handed golfer it was my trail leg. I had to do something similar to the OP. Most of my weight was forward and I had to go as far as having my right heel off the ground at a dress due to not being able to straighten my leg. That year I hit every club in the bag the farthest I ever have. 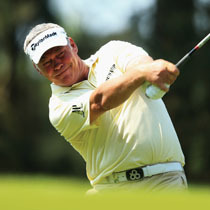 The following year when I could walk right again I swing normal and my game went in the crapper for the next few years. To this day I haven't really got any of the distance back. I tried it again a little last summer with a little success but then forgot about it again. But I know I did have alot of weight forward because my right leg just did not function.